Juki HZL-DX5 Computerized Sewing and Quilting Machine $1,199.00 - FREE SHIPPING! If you’re looking for a high-performance sewing machine that can also act as a combination quilting machine, then look no further than the HZL-DX5 model offered by well-known sewing machine brand Juki. This machine makes use of industrial technology. Juki’s “box feed” system is brought to the Juki HZL-DX5 home machine to allow you to create precise, beautiful and high-quality stitching on all kinds of fabric. The Juki HZL-DX5 is also great with thick fabrics and layers and sews even stitches thanks to the floating function for the presser foot. This action raises the foot ever so slightly so it can glide over fabric without pushing or pulling. Buttonholes also become easier to create on the Juki HZL-DX5 thanks to Juki’s technology which marries both modern and industrial systems to create a one-step buttonholer using a sensor system. With this feature, you can create 16 different types of button holes for use on all kinds of fabrics. This machine can also be used for free-motion sewing, thanks to the ability to drop the feed dogs. 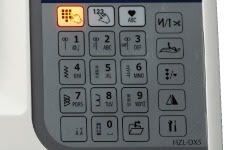 The Juki HZL-DX5 is incredibly easy to operate with quick-select buttons that include start/stop, lock stitch, reverse stitch, trim thread, up/down needle position, and auto lift for presser feet. You can also control this machine with the foot pedal since you can assign a function to the heel side of the pedal. Selecting stitches and patterns is made easy by the touch panel. The machine contains 80 stitches, with 3 alphabet/number fonts. It sews with a max speed of 1050 spm. The HZL-DX5 comes with 25 accessories and a Juki warranty of 5 yrs for mechanical defects, 2 yrs for electrical defects, and 90 days for material and/or workmanship defects. 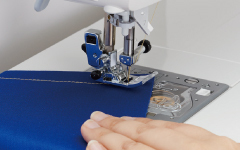 The Juki HZL-DX5 - Professional Quality In A Home Sewing Machine!